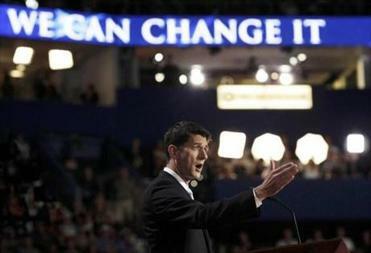 Republican vice presidential nominee Paul Ryan addressed delegates at the Republican convention. Paul Ryan’s speech Wednesday night could mark the launch of a great career – but it could also be the start of a long journey into the wilderness of extremism. It was less about Ryan’s own vaunted budget plan than an attack, in the needling voice of the House GOP majority, on President Obama’s economic stewardship. As expected, the speech delighted the Republican base because it painted Obama as the entitlement-driven liberal that many GOP delegates have always believed him to be. The crowd needed this moment of catharsis; Tuesday night’s keynoter, New Jersey Governor Chris Christie, had gone fairly light on Obama, and the other major speaker, Ann Romney, concentrated solely on her husband. But Ryan’s bill of particulars against Obama strained credibility enough to damage his own, not-quite-earned reputation as a straight shooter. He attacked Obama for failing to keep open a General Motors plant in Wisconsin – a cheeky move for a vice-presidential nominee whose standard-bearer once wrote that the government should allow all of GM to go bankrupt. He attacked Obama’s stimulus bill, a large percentage of which was comprised of tax cuts and aid to states to cover the salaries of teachers and law-enforcement workers who would otherwise have been laid off, as “political patronage, corporate welfare, and cronyism at their worst.” The cronyism charge, in particular, hasn’t even been taken seriously by Ryan’s own GOP House colleagues. As for Obama’s health-reform bill, Ryan declared it to be “2,000 pages of rules . . .that have no place in a free country” – issuing a Palin-like ideological imperative that seemed to violate the common-sense tone he was trying to maintain. A transcript of Representative Paul Ryan’s remarks Wednesday night at the Republican National Convention, as provided by the Republican Party. And his attack on Obama for having “funneled” money out of Medicare to pay for new “entitlements” was disingenuous on many levels, the most obvious of which is the fact that the exact same Medicare cuts were replicated in Ryan’s own budget, which added copious additional reductions of its own. By the time that Ryan declared, “We want this debate, our nation needs this debate, we will win this debate,” the notion of a reasonably fair-minded duel between two economic philosophies seemed less likely than ever – and a battle of bombastic charges, many of them deeply hypocritical, seemed likelier than ever. 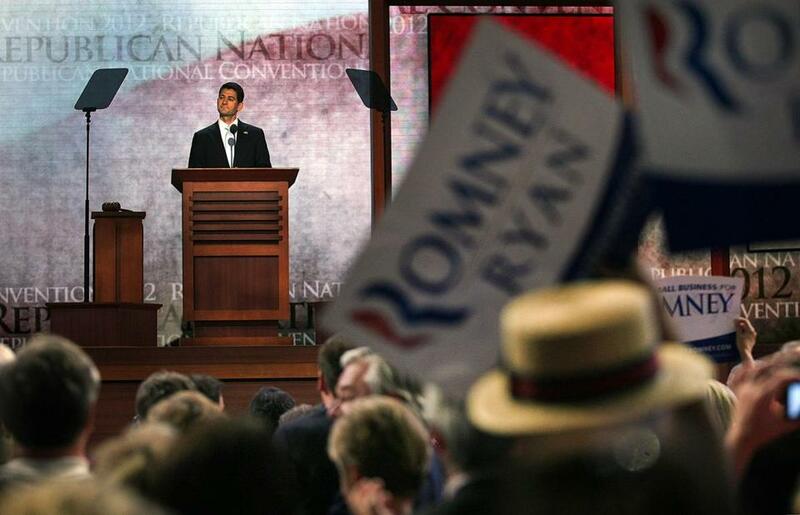 By the time that Ryan was decrying a “government-planned life, a country where everything is free but us,” and warning about “the supervision and sanctimony of the central planners,” his gaze seemed to have left the room entirely and focused on some Tea Party rally in the heartland. Will anguished Americans respond to his call? Some certainly will. He offered the reassurance of ideological certainty in the pure and reedy voice of an altar boy. But others, including many people who cheered his selection as vice presidential nominee in anticipation of an open, honest clash of economic visions, will be disappointed. Ryan’s boyish manner hid an almost frightening sense of confidence. When he talked about his differences with Mitt Romney, but assured the crowd they mattered little, he seemed to be assuming the role of party leader for himself. Someday, perhaps soon, he will be – but only if he makes it out of this campaign without alienating everyone outside of his conservative cheering section.